Men, particularly the elderly, die at a disproportionately higher rate than other population groups. It’s a well-known fact to those studying tornado fatalities, but what researchers are trying to find is a way to keep more of these high risk men responsive to alerts and therefore save lives. 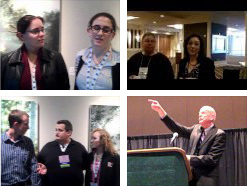 Wednesday morning at the AMS Annual Meeting, several researchers discussed their research on tornado fatalities. The policy session, chaired by Kimberly E. Klockow of the University of Oklahoma, showed that social sciences and data collection methods are improving the way we can analyze deadly storms and adequately warn the public before these storms strike. Amber Cannon of the University of Oklahoma started the discussion with a comparison of data from tornado outbreaks in Alabama on 3 April 1974 and 27 April 2011. She noted that, although more people died in the 2011 outbreaks than in 1974, the population density had increased during that time. As a result, the fatality rates very similar. If the death rate isn’t going up, then maybe we can bring it down. Shadya Sanders, from Howard University, presented her research regarding the super outbreak of tornadoes in 2011. She found that, while a 45% tornado risk seems huge to a meteorologist, the average person may not see the gravity of such a situation. Her work with focus groups has shown the importance of education for children and risk awareness for adults. Soon, according to Hope-Anne Weldon of the University of Oklahoma, there will be a “one-stop shop” for killer tornado information from the NOAA/NWS Storm Prediction Center. Weldon spent an entire summer filling in gaps in data about tornado victims, clarifying tags of age, gender, and domicile in statistics for 1991-2010–in all 400 tornadoes killing more than 1,100 people. With more detailed data, she noted, social scientists will be able to draw even better conclusions.